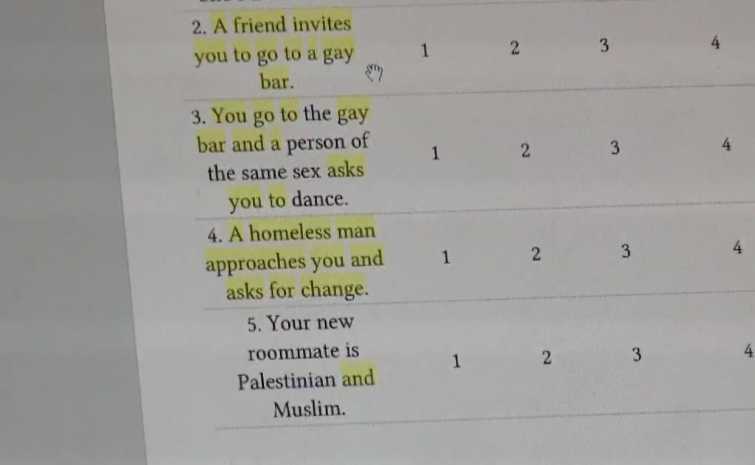 SPRING HILL, Fla. — A middle school teacher in Florida has been fired for issuing a survey/exercise to students that asked them about their comfort level in situations surrounding matters of gender, sexuality, religion and race. Those who complete the survey are asked to choose from “not comfortable at all,” “uneasy,” “fairly comfortable” and “completely comfortable” for each hypothetical scenario. However, some of the students became concerned about the content of the survey, which was intended to be used with college students. Sixth grader Tori Drews told WFTS-TV that Cox had second thoughts about the assignment after some complained. Drews said that some students asked if they could show the survey to their parents, but Cox didn’t want them to do so as she would just nix the assignment. But parents did learn of the exercise and believed that the questions were inappropriate for 12 and 13-year-old children. The Hernando County School District investigated the matter and decided to fire Cox, who was within her probationary period. “In no way did this assignment meet the standards of appropriate instructional material,” read a statement from the district issued to WTSP-TV. “After being made aware of the assignment, school administration began an investigation and has taken immediate disciplinary action. This teacher was within her probationary period and has been released from employment,” it advised. Cox has not responded to requests for comment.